Just as I was pulling out the last jars from the hot water bath, my friend Eric popped over with a half dozen doughnuts from Voo Doo Doughnuts in Portland as my reward for visiting his kitty while he was on a road trip. 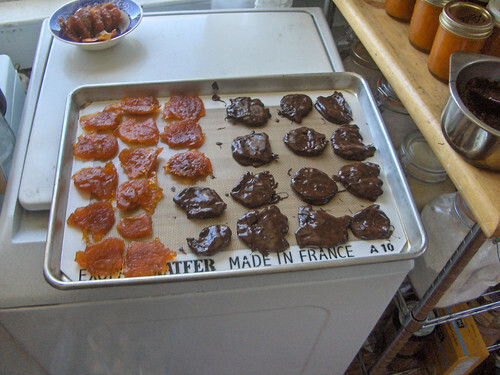 Putting aside my excitement - I actually managed to chocolate dip a tray of candied apricots first - but have to do it in two batches because I ran out of chcolate. DOUGHNUTS! Eric confessed two things - there's nobody over 35 in Portland, and they have a bizarre passion for doughnuts in general. Though he isn't generally a doughnut person, he said he likes what they're doing with vegan doughnuts and brought me 6 yummy confections in a pink box (as we all know - "good things come in pink boxes") -- a maple bar (my favorite! ), a crazy purple fantasy frosted concoction, a yummy looking chocolate covered mystery, one covered with crushed oreos and vanilla frosted with coconut flakes. And, yes, I did take pictures.